Puppy leash training seems to be a lot easier than older dog leash training. According to this article training your puppy the right way when they are young (they usually want to learn) rather than trying to re-train an older dog is much easier. My cousins walk pretty good on a leash, but the oldest (I would consider her my grandma) pulls pretty hard if she isn’t wearing a harness. 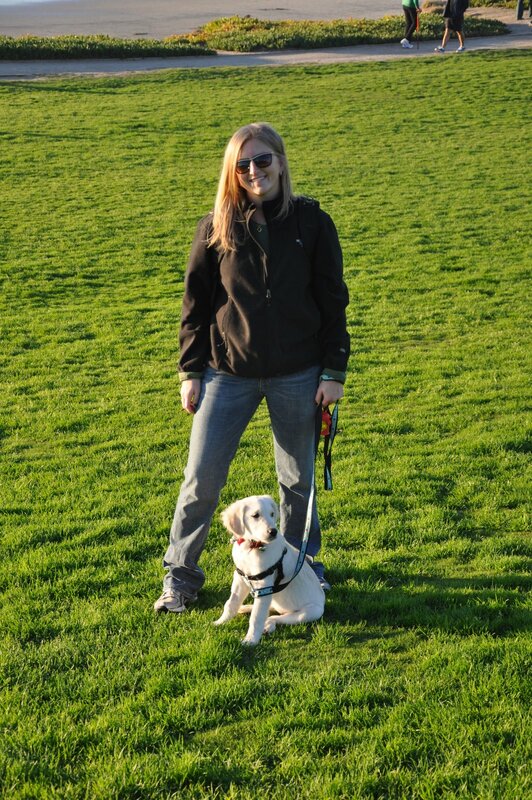 There are a lot of myths about leashes, and about leash training…. I’m pretty sure you won’t know what kind of training your puppy responds best to until you train him or her. I learn best with treats and clicks and ‘Good Girl’ and ‘come on’… My mom calls my name while we walk and I look back at her. When I do she gives me a little treat so that I know I did the right thing. (I usually get a click first) I really enjoy when she talks to me a little bit while we are walking… it keeps me on track with the task at hand. I started wearing a collar when I was really tiny, probably only 2 or 3 weeks old, so the only thing foreign to me was the name tag and the little jingle that it made, especially the jingle when it hits my food bowl. I now wear a harness sometimes to walk, which was annoying at first, but I’m ok with either a collar or a harness now. When I first was put on a leash I wanted to chew on it and carry it in my mouth, but I quickly learned that this is NOT what mom wanted me to to as she would make the TSST sound when I did it. I also learned that when I dropped it out of my mouth she gave me a treat… and I like how the treats taste better than the leash so I dropped the habit. Now I walk proudly down the street only stopping when something smells TOO GOO TO RESIST! Sitting patiently, waiting to GO AGAIN! I hope you like how I sit while I wait. I learned that every time we stop, I should sit down next to my mom to wait for her cue to go again. Another thing I noticed recently is that when I go on walks I tend to have to ‘do my business’ while we are walking and I noticed that mom always carries bags to pick up after me. She is so nice! Many more walks to come in the future as I get to go on 2-3 a day now!!!! life is good!